Thank you, Susan, for introducing me to the wonderful A Cosy Kitchen blog. A weekend DIY: Butterfly Tree. I read Gatherings magazine for the first time. Mia shared her breathtaking new gallery space and shop. A tour of the new West Elm store in Seattle. Loved details in this Bandy Canyon Ranch wedding in California. The photography in Aran's post on food styling and photography in La Dordogne blew me away with it's beauty. The Front Door of my Future, inspiring theatre, magical lights on the Southbank, colourful bowls and more in last weekend's 10 Things I Learned and Loved. My highlights from the first ever Renegade Craft Fair in London. Tear sheets from the October issue of Martha Stewart Living. Autumnal dining room inspirations from The Conran Shop's new window display. 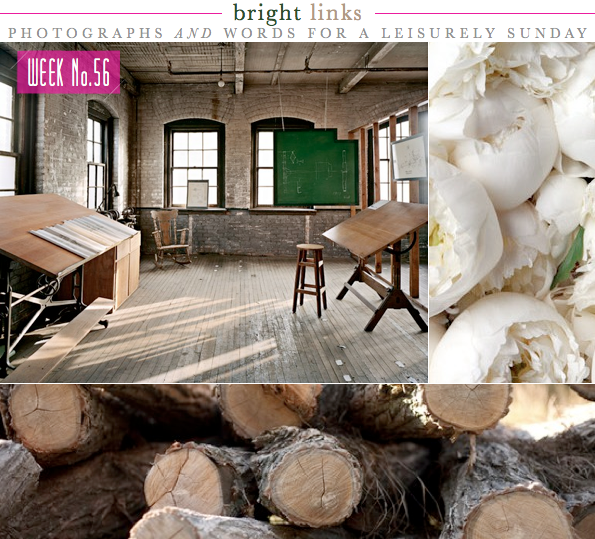 Introducing a new column on Bright.Bazaar - Tablescape 101. A light-filled bedroom in a calming blue and white colour palette. and thank you for the intro to cozy kitchen! Those pictures are right up my street! All things nature and wood really attracts me this season of the year. Hope you've had a lovely weekend! That's probably the most beautiful peony photograph I've ever seen. And thanks for the cozy kitchen tip - another beautiful food blog that will give me inspiring recipes on what to do with stuff from my garden! I got excited for one second when you said thank you Susan...thought you might have seen my kitchen, ha! Great post Will...love them all!